A summer 'vortex' of cold air over the Karakoram mountain range is causing the glaciers in the region to grow in spite of global warming, scientists have shown. Publishing their findings today in Nature Climate Change, the team from Newcastle University, UK, have identified a large scale circulation system—or vortex—centred over the Karakoram, a large mountain range spanning the borders of Pakistan, India, and China. In winter, the vortex affects the temperature over the whole 2,000 kilometre mountain range, but in the summer the vortex contracts and has an effect only over the Karakoram and western Pamir. This induces an anomalous cooling in summer which is different to the warming seen over the rest of the Himalaya. Co-author Professor Hayley Fowler, says this Karakoram vortex goes some way to explaining why the glaciers in this region are behaving differently to those in most other parts of the world. "While most glaciers are retreating as a result of global warming, the glaciers of the Karakoram range in South Asia are stable or even growing," explains Professor Fowler, Professor of Climate Change Impacts at Newcastle University. "Most climate models suggest warming over the whole region in summer as well as in winter. "However, our study has shown that large-scale circulation is controlling regional variability in atmospheric temperatures, with recent cooling of summer temperatures. This suggests that climate models do not reproduce this feature well. "We don't know how climate change will affect this circulation system and what the effect of sudden shifts might be. 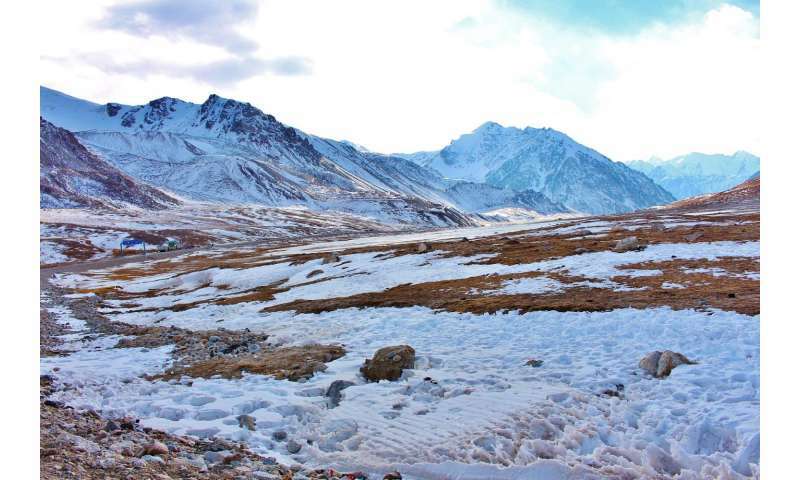 "But the circulation system is currently providing a dampening effect on global warming, reducing glacial melt in the Karakoram region and any change will have a significant effect on ice melt rates, which would ultimately affect river flows in the region." Usually, glaciers oscillate between growth and retreat. Snow falls on the peaks and gradually compacts and turns to ice while lower down the glaciers lose ice to melting and evaporation. If snowfall equals snowmelt, the glacier is in equilibrium but global warming has tipped the balance so that most of the world's glaciers are shrinking. The Karakoram anomaly was first described in 2005 and since then, scientists have been trying to determine what might be causing the expansion of glaciers in the region - which includes the world's second largest mountain K2. Acting like a counter-weighted temperature control, the unique summer interaction of the Karakoram vortex and the South Asian Monsoon causes temperatures in the Karakoram and Pamir to cool while those in the Central and Eastern Himalaya are warming, and vice versa. Over recent decades, these vortex-monsoon interactions have resulted in stormier conditions over the Karakoram. "This vortex provides an important temperature control," explains Newcastle University's Dr Nathan Forsythe, lead author of the study. "It is therefore important to look at how it has changed and influenced temperature over the last century so we can better understand how a change in the system might affect future climate. "This is of huge importance in terms of food security because of the large populations that rely on water resources from snow and ice melt from the mountainous catchments to grow their irrigated crops in the Indus Plains of the Sindh and Punjab states and provinces of Pakistan and India." The last paragraph in the article says it all. Both India and Pakistan are armed with nuclear weapons. This is not a good situation should it turn out that this effect dissipates with increasing warming. The human-scale implications are alarming: mass starvation. But the geopolitical implications are even worse: mass starvation in adjacent nuclear armed states that are not on friendly terms. Now throw China, just across these same Himalayas, into the mix and this could have some extremely serious consequences. Oh wait, you never read those did you? even when i linked the free versions! Hey look ! aussie scientists are Stumpified , can't find a thermometer that works ! Please tell us again how you don't understand things but have opinions about them.